What Is a Bat and Why Do You Need One? First up, what is a bat? A bat is quite simply the removable material (usually a circular wooden board) that you attach to the wheel head of your pottery wheel. The reason that you use a bat is so you can easily remove your thrown piece from your wheel head. If you don't use one, you'll have to remove your work with a wire and move it to another board to dry, which is tricky, as you risk damaging your newly thrown piece. It's far easier and safer to remove the whole bat with your work on it. Potter's wheels generally only come with one bat. If you want to be able to throw multiple pots, you will probably want to have a number of bats on hand, which can get pretty expensive. Begin by checking how high your pottery wheel's pins stick up. You should make sure to buy particle board that is at least that thickness (usually 1/4 inch). Note: You can also use pressed wood, composite board, and Masonite. Do not use plywood. The layers will delaminate due to the water and splinters will become a hazard. Using the original bat, trace the outer circumference and the openings for the pins. Work the placement so that you can get as many bats as possible out of the particle board. Fit your drill with the proper sized bit. The shank of the bit should fit the openings in your original bat with no room to spare; you need the fit to be as snug as possible. The only discrepancy there may be is if your original bat has an elongated hole to allow for easier removal from the wheel head. After drilling the holes, check each bat on your pottery wheel's head. Should you have some trouble getting the bats back off (due to a tight fit) you can use a router or high speed rotary tool bit to elongate a pin opening slightly. Be certain always to elongate toward the center of the bat, never side to side. Side to side space will cause the bat to chatter on the wheel head while you are trying to throw. If your wheel does not have bat pins in which to attach your board bat to, then you can throw your own bat pad out of clay to attach it to. Firstly, take your lump of clay and throw it down hard onto your wheel head. 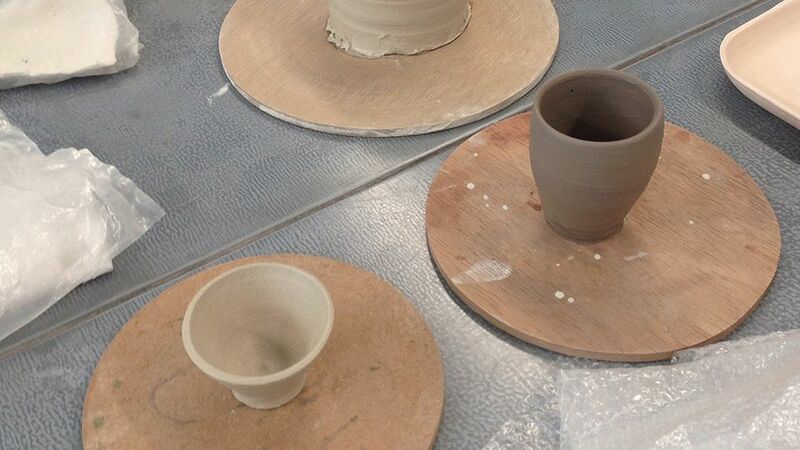 Make sure your clay is centered and then push down with your hand. Then you can either push your fingers down into the centre of the clay and stretch the clay out or push gently on the outer edge of the clay. The aim is to have a very flat, very even layer of clay on the wheel, roughly around a quarter of an inch thick. Then take a wooden rib to press down and compress it further onto the wheel. The bat pad should almost fit to the edges of the wheel but not completely. Wet the disc of clay, but do not soak it. You'll then need to create your grooves. You can use your finger to create concentric circles around an inch apart or a tool. Then take your bat pad (it should be slightly bigger than your wheel head) then slam it down hard onto your clay disc. Spin the wheel slowly, the bat pad might wobble, so you'll need to keep tapping it gently, until it's stuck fast. You'll then be ready to throw your piece on your newly attached bat.